The idea for this story actually came to me from our writer, Jennifer Kaplan, but since I’ve written on this topic before, she asked if I might want to tackle it – Sure. 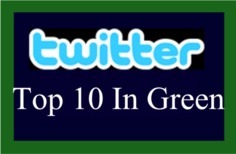 A few months back, Darren Rowse challenged his readers to create a top ten to follow list to Twitip. As you can see, 192 of us responded with out top ten list folks who Twitter on a wide variety of topics. My list was green. But, I’ve had a chance to think about it some more. Trying to determine how to best build your list of followers can be a challenge and a raging argument is going on right now with the Twitterati on quality versus quantity. Is it better to follow lots of people and have lots of followers or does the quality of the follower matter? As a marketing guru, I lean toward quality. I tweet almost everyday and I’ve set up Twitter accounts for several clients and have carefully managed which people we follow; at what rate we gain followers and how closely they match the target market we are attempting to reach. So, if you’re looking for green folks to follow on Twitter, take a minute and consider, what sort of green people should I be following? Twittergrader lists the most influential Twitters using the key word, “green”. But then again, there you have a hodgepodge of healthy living, green tech and green business folks, including (yours truly, @mcmilker), @ecochildsplay and @ greenoptions. Actually, quite a few Green Options writers are on this list. What you really want is a list of people to follow that meets your particular needs. Regardless of your approach to green, there are Twitter streams out there that will interest you. Now I’ve given you a lot more than 10 people to follow. It’s your turn. Who writes your favorite green Tweets? Update: I hadn’t even published this list, but mentioned I was working on it on Twitter, @choosespun, @a_willow and a few others have already responded! The power of social media! What Do Ecopreneurs Say Their Most Effective Marketing Is?